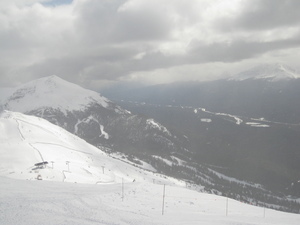 Is it snowing in Lake Louise ?Tack! 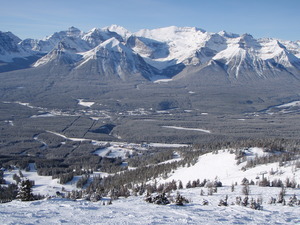 Lake Louise is located in the Rockies and has some of the most spectacular views from any chairlift in the world. Your pass will allow you to ski at Banff, Sunshine and Norquay so there is little reason to be bored. There is a really good mix of runs too, with many of them being marked as expert. 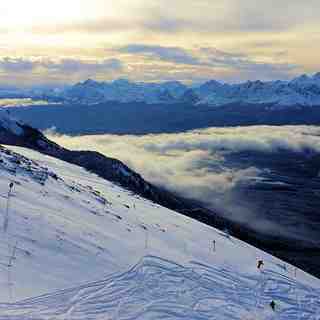 Intermediates and beginners will not be disappointed at Lake Louise either. 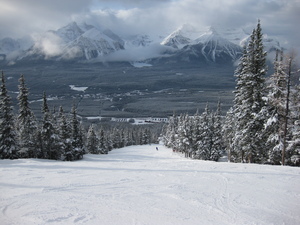 As for the snow record, Lake Louise is the envy of European resorts. 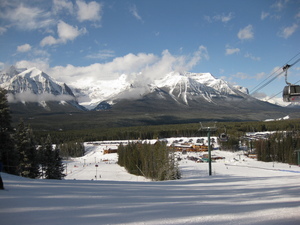 The resort towns of Lake Louise and Banff are great too, although Banff is livelier, there is plenty to do. Food is good and portions large; just what you want. Try some local brews such as Grasshopper, one of the local micro-breweries. Just remember to tip well and wrap up well, oh and don't mess with the elks. They are big and have horns, you are small and do not. All I can say is wow. This resort way overcame expectations in every way. 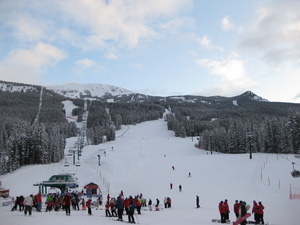 The steep lift-accessible terrain way exhilarating and exactly what I came to the rockies for. Lots of medium sized cliffs to jump off with beautiful landings and no worry about rocks underneath the snow since they've got a base of 247cm! The groomers were very well taken care of for my wife who normally skis blues but I boosted her confidence and she really excelled all over the mountain. After riding Sunshine Village and having to rent a beacon to ride what they call a 'freeride zone' was a joke compared to what Lake Louise has open daily. I'm glad I at least went so I can forward people over to Louise instead! My wife was bored of their short flat runs after two hours. We are off to Kicking Horse to see what they have to offer and I hope it is half as good as Louise and we will be having another amazing day! Thanks for the best three days of skiing we've ever had! Special mention to the Northface Bistro for a delicious buffet at a great price and the snowmakers that confirmed my directions to the awesome skiing.